An intensive, five-year Middle States self-study at the Academy of the Holy Angels recently culminated in the highly successful Sustaining Excellence Colloquium. This event was so notable that Middle States Association President Henry Cram and Associate Director Pat Impreveduto have asked AHA to mentor other school administrators who use this protocol. 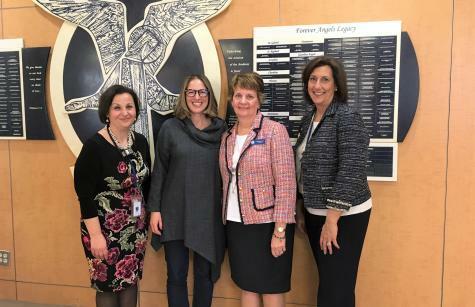 Impreveduto and Cram informed AHA Principal Jean Miller that AHA is one of only 20 schools out of a field of nearly 500 that was granted the privilege of using the Sustaining Excellence Protocol for reaccreditation. In order to use this protocol, a school must demonstrate effectiveness in growing, improving, and sustaining student performance, particularly in academics. The school must then choose a self-study topic. AHA selected growth mindset. As described by Dr. Carol S. Dweck, growth mindset encourages individuals to view stumbling blocks, and even failures, as pathways to growth and learning. Dweck encourages people to embrace challenges and continually learn from their mistakes. Those who espouse a growth mindset believe people can learn anything. “Our study hypothesized that ‘The adoption of a growth mindset (the belief in the capacity to develop one’s abilities through effort over time) by members of the school community will create a transformative environment that promotes resilience, personal growth and a desire to learn,’” Miller explained. After five years of intensive study, Miller noted that AHA has achieved its predicted goal. AHA’s full-day colloquium was spearheaded by Internal Middle States Coordinators Dr. Martha Weinstein and Carmen Quiñones. Guests included Middle States Association representatives and educators who traveled from several states, including Maryland, Delaware, Pennsylvania, and upstate New York. Afternoon events included interactive workshops that involved specific aspects of the growth mindset. Principal emeritus Jennifer Moran was featured in a video that included a historical perspective. Moran was principal when the self-study was launched, and she was the driving force behind bringing growth mindset to AHA. AHA Principal Jean Miller noted that growth mindset is a perfect fit for AHA, which seeks to allow students to realize the fullness of their potential. Students are encouraged to interpret their mistakes and experience growth. AHA teachers Patricia Prucnel and Christopher Petrozzo presented a workshop about the psychological and neurological elements of growth mindset, including a look at memory and retention and the impact of stress and “pruning.” During sleep, the human brain “prunes” input from the day, storing only the items it considers relevant. Carmen Quiñones moderated a student panel on how growth mindset has influenced their education. Panelists include Julia Farah, Ashley Hess, Katherine Gazzini, Joanna Scorese, Maria Hannoush, Aimee Hannoush, Heidi Hannoush, Samantha Romano, Hannah Velarde, and Amelia Brunda. One student revealed that she wanted to earn better grades, and began to review her work and speak with her teachers about how she could improve. The Angels noted that it is difficult to retain a fixed mindset and truly enjoy learning. Fixed mindset refers to the idea that skills are innate and people either have, or do not have, the ability to succeed in a particular area of study. Later in the day, one of the girls from the panel mentioned that she tried an experiment for one quarter. She decided to simply enjoy her classes and not check her grades or worry about her marks. At the end of the quarter, she found that her grades had improved. Teachers, coaches, and parents also shared their experiences with growth mindset during these workshops. Sue Herrera moderated a group that included parents Deborah Beckmann, Dr. Gretchen Hannoush, Nadine Behrens, Joseph Canney, and Kerry Ann Flahive. Flahive said growth mindset is the reason she sends her daughters to Holy Angels. The girls receive the message that they are in control of their grades and their futures. AHA President Melinda Hanlon asked the parent panel how parents perceive growth mindset when they first visit the Academy. Beckmann said she and her husband were looking for a high school for their daughter, but not necessarily a Catholic school. When they visited Holy Angels together, Beckmann said her husband “was completely sold on growth mindset” after hearing from the administration. Herrera added that she believes many families will embrace growth mindset. She previously pointed out that there are entrenched legacy issues within high schools and colleges that have not adapted. However, she pointed out that Angels are empowered to handle “old style” attitudes. AHA began the reaccreditation process in 2014, and is currently halfway through the 10-year process.